Studies in ethical fandom: Is it ever appropriate to leave a major-league baseball game early? So you want to be a true major-league baseball fan. 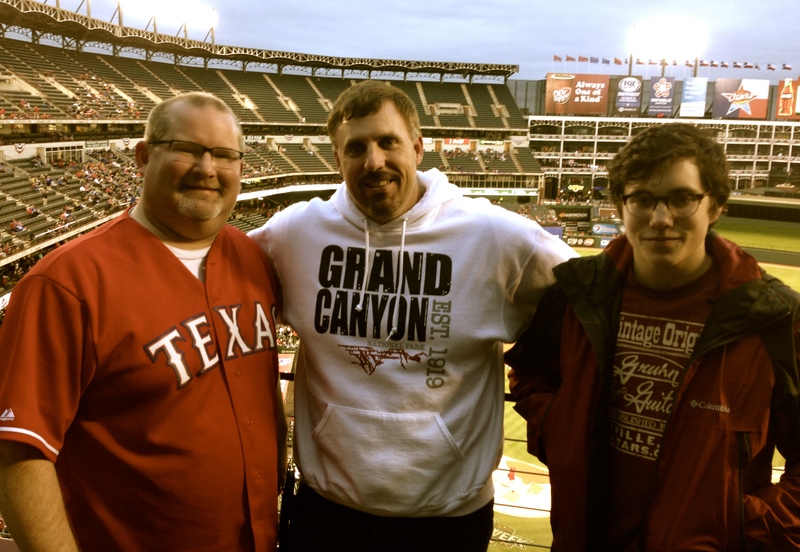 With my friend Steve Holladay and his son, Griffin, at a Texas Rangers game this week. Understanding the unwritten rules for supporting your team will help. 1. A foul ball strikes you and breaks your nose. 2. A tornado swirls over the ballpark. 4. Your pregnant wife goes into labor. For each hypothetical situation, the specific response will depend on the exact circumstances. 1. The nose pain may be severe, but don’t let that be the deciding factor. If the bleeding is limited, take an ibuprofen tablet and ask the ballpark attendant for an ice pack. Don’t even consider leaving for any injury less severe than a skull fracture. 3. Is the pizza deep dish or stuffed crust? Seriously, this one is a no-brainer. Wipe the sauce off your face and enjoy the game, no matter how embarrassed you may be. And wave at the offending fan as security escorts him out of the ballpark. 4. This one hinges on whether the pregnant wife is at the game. If she’s with you, remind her that after nine months of pregnancy, she surely can wait nine innings before delivering the child. Encourage her to ignore the contractions and focus on the game. But if she’s elsewhere, urge her to call a relative or friend or dial 911. Assure her that you will be thinking of her between innings and will leave the ballpark as soon as the game is over. Note to all women (including the one who lives with me): Surely you can understand that I am joking. In the above scenario, I absolutely would head straight to the hospital, unless there was a doctor available in the stands or it was a crucial game with postseason implications. Random confession: My dad, my 17-year-old son Keaton and I left Wednesday afternoon’s Angels-Rangers game in the sixth inning. Why? Los Angeles was shellacking Texas, 10-1, and we were sweaty and sunburned — with Keaton and me facing a four-hour drive home to Oklahoma. Personally, I almost always stick around until the final pitch. But I make rare exceptions in blowouts. When a game reaches the point that the manager starts benching starters, then I figure I can head to the exit and still be considered a true fan. I asked friends on Facebook to weigh in on when, if ever, it’s OK to leave a major-league game early. Your turn: Have you ever left a major-league game early? If so, why? Tweet me @bobbyross. See a map of all the major-league stadiums at BallparkChasers.com.